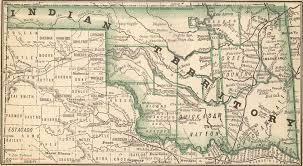 Before statehood (1907) there were three kinds of schools in what is now Sequoyah County: Missions, Subscriptions, and Cherokee Nationals. The Cherokee National and Subscription were the first types of schools in Hanson, Indian Territory. The town of Hanson had its beginning with a store and post office on the farm of Robert E. and Bettie (Blair) Sutton in 1888. It was located about one mile east of the present town site. A short time later the railroad built a depot at the present town site and the town got its name from a railroad official. Subscription schools were held in homes at first. 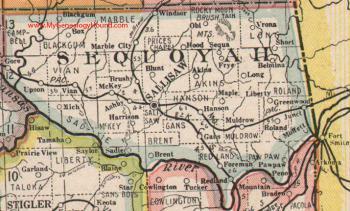 The Cherokee National School for the Indians was located northeast of the railroad station in Hanson. Nora Bradley was the first teacher. Some of the children rode horseback and the ladies had side saddles. The school grounds were used by the Cherokees for picnics and Green Corn Stomp Dances. There would be plenty of barbecue and cold drinks. The picnic and dance would last two or three days. They would dance around the campfire at night in their colorful costumes with bells on their ankles to the beat of drums. Whites began moving into the vicinity of Hanson in the early 1900s. Sometimes children of white parents were allowed to attend the Cherokee National School by paying a tuition - usually about 50 cents a month. In 1893, the Baptist Church at Hanson was established so a subscription school for the whites was held there. Soon after statehood a new two-room school building, Hanson District No. 7, was built. It was located at the foot of Sutton Mountain, what is now called Hanson Mountain. It was just north of the old Cherokee National School. J. H. Dodson and Nora Bradley were the first teachers. Between the two rooms of the new building was a folding partition. When folded it would make a large auditorium which would be filled with parents to see their children perform. The school soon became overcrowded and the intermediate grades were moved to the Methodist Church until a third room could be built. Some of the early teachers besides Miss Bradley and Mr. Dodson were Mr. Burke, B. S. Myers, Cleo Blaylock, John Harris, E. V. Dawson, J. K. Bass, Raymond Howell, Ben and Edith Mills, Tommie Wofford Spears, Mr. Hedrick and wife, Gertrude Goode Garvin, Lorena McEver, LaVeta Cheek, and Fate Rogers. Mr. Dawson organized the first basketball team for girls at Hanson. Their uniforms were black sateen bloomers, box pleated all around with elastic at the knees, and a long sleeve white middy blouse. Soon after statehood two new schools, Ward and Mershon, were started. Ward School was located in the western section of the present district. It was built on land donated by Oscar Ward. Ward school was an outstanding rural school noted for fine literary performances and also excellent girls basketball teams coached by Richard Mills. Oliver Long was the first teacher. Others were Henry Burrow, Frank Martin, Byrd Bradley, and Jess Harrell. Mershon was a one room building south of the Kansas City Southern Railroad near an artesian well. The land was donated by Edmond Fleetwood. Mr. Yoakum was the first teacher. Mershon School was named for Fred Mershon who was the first Superintendent of Schools for Sequoyah County. Parents of these two schools were interested in higher education for their children so they voted to merge both schools into one called Mershon. A site near the center of both districts was agreed on. This new site was approximately 1/4 mile north of Fleetwood Gift Shop. A new four-room brick building was completed in time for the 1918-19 term of school. Mr. Gabbard was the first Principal. He was succeeded by J. W. Gilbert, Richard Mills, and Eugene Kuykendall, respectively. During Mr. Kuykendall’s administration, 1924-25, he offered one year high school courses. He began to think of what a noted educator had said, “For a person to grow up and die in his ignorance, that I call a tragedy.” He thought of the many tragedies in Sequoyah County, especially around what is now Central High community. Very few of the district residents could send their children away to high school and the limited valuation of the Mershon School District couldn’t finance a program for a four year high school. At that time the Hanson School District had several students attending the one year high school courses at Mershon. They suggested that their district join Mershon in a Union Graded plan, which would more than double the valuation of the two districts. They could then vote a bond issue and build a new building about midway between the two schools. The plan was adopted and a date set for a vote on the bond issue. The bond issue passed by an overwhelming margin. A new brick structure containing four classrooms, a library, an office, and an auditorium was erected on the present site and was known as Central High U. G. #4. When the new building was completed in 1926, Mr. Kuykendall transferred his work there. His wife, Byrda, was hired to teach high school History and English. In this new location, the 1926-27 term of school began with the seventh, eighth, and high school students in attendance. The first six grades were still taught at Hanson and Mershon. The first senior class graduated in May 1928, with six members, Sallie Farmer, Hazel Brewer, Inez Hoppis, Lloyd Lattimore, Fate Rogers, and Charlie Rigsby. They planted six trees in front of the school to stand as sentinels, guarding the memory of those happy days. Mr. Kuykendall held the position of Superintendent until 1929. Everyone dressed for warmth in winter, wearing long underwear and the girls wore long cotton hose. All the students walked to school as there were no buses. The first bus Central had was around 1928. Elvin Cullum was the first driver. Students from Maple and Long were now able to attend high school. Wells supplied drinking water. Everyone drank out of the same bucket and dipper until later each student furnished their own cups. Students had to buy their own books. Heat was from big pot-bellied stones until about 1947-48 when butane was installed. Hot lunches were unheard of. Students took their lunches in sacks, or syrup or lard buckets, which contained biscuits, eggs, sausage, bacon, stickies, or cookies. The first hot lunch to be served was soup made in large black kettles outside. Sometimes bus drivers were pressed into double duty by helping to cook the soup. Students furnished their own bowls and spoons, and formed lines to get their soup. It was in the 1940's that a kitchen and dining room were built. Outdoor restrooms were used until about this same time when modern bathrooms were installed. A gas generated electric light plant was installed where they furnished lighting to the gym and other areas. Some of the activities were spelling bees, ciphering matches, literaries, dialogues, weekly assemblies, class plays, class parties, candy breaks, baseball, basketball, track and field meets, and horseshoe pitching. A glee club was organized under the leadership of Mrs. Byrda Kuykendall while Mr. Kuykendall was Superintendent. The first 4-H Club was organized in December 1930. 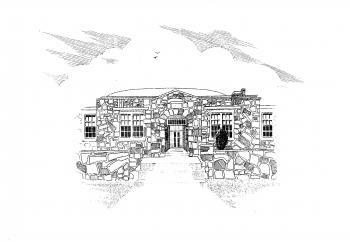 During Mr. Ferguson’s administration a four-room native stone building was completed in 1938. All grades from Hanson and Mershon were then transferred to Central High. Between 1939-41 the high school building was remodeled and enlarged. 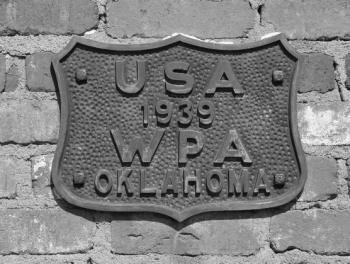 Federal funds were secured under Works Progress Administration (WPA ) in 1939 to build a native stone building. Two more classrooms were added to the high school with a kitchen and dining room, a stage with adjoining dressing rooms, and a standard gymnasium with greater seating capacity. As the years passed several small dependent school districts consolidated with Central. They were Seven Oaks, Sequoyah (Miller Ridge), Akins, and Maple. With all these smaller schools joining, attendance increased, and more facilities were built to accommodate the increased enrollment. A new elementary classroom building and a new junior high building were built during the administrations of Faye Randolph and Bob Barbee. On January 23, 1975, all high school classrooms, two offices, a book storage room, a storage room, and the gymnasium were completely destroyed by fire and had to be rebuilt with much help from volunteers in the community. In August 1982, the first football program was started and a field was constructed. Due to the size of the school, eight man football was played. Baseball and softball fields have since been constructed as well. During the administration of Max Tanner, an eight-classroom addition was made to the elementary. Also, through grant money a FEMA Safe Room was constructed. Due to increased enrollment, the school was moved to Class A eleven man football from eight man football, requiring the construction of a new football field. New concession stands were built at all athletic fields, parking lots were paved and 35 additional acres of land acquired for future growth and progress. Zemri Davis was Superintendent 1929-30, J. H. Walkup 1930-35, G. F. Cundiff 1935-38, C. J. Ferguson 1938-41, J. W. Gilbert 1941-45, Faye Randolph 1945-51, Tom Randolph 1951-61, Arthur Blackburn 1961-63, Billy Kinsey 1963-67, Faye Randolph 1967-74, Bob Barbee 1974-96, Dean Pratt 1996-2000, Donna Cupp 2000-02, Max Tanner 2002-2014, and Larry G. Henson 2014-present.